The association of insulin-dependent diabetes mellitus (IDDM) and celiac disease (CD) has been widely reported in children but the relationship between the two conditions is incompletely understood. Moreover, specific studies on intestinal biopsies of patients with the association of the two diseases are still lacking. We studied the ultrastructure of the duodenal mucosa in 12 patients with both IDDM and CD. All patients had either total or partial atrophy of duodenal mucosa. In seven subjects, an accumulation of electrondense granules in the apical cytoplasm of groups of enterocytes was found. In four of them, a double population of granules existed (mean diameter: 400-800 nm and 100-200 nm respectively) showing a biphasic pattern. In the other three patients, only smaller granules (100- 200 nm) were found in the enterocytes. The present work suggests that patients with IDDM/CD may represent a subgroup in the context of the CD population. Intestinal biopsies of such individuals often show accumulation of electrondense granules in the apical cytoplasm of enterocytes that can be interpreted as incomplete gastric metaplasia. The association of insulin-dependent diabetes mellitus (IDDM) and celiac disease (CD) has been widely reported in children [1,2,3]. The prevalence of CD in patients with IDDM is significantly higher than that found in the general population (about 1:300), ranging between 1.3 and 19% [4,5,6,7,8,9,10,11,12]. Although the relationship between the two conditions is incompletely understood [13,14,15], previous genetic and immunogenetic studies suggested a common autoimmune pathogenesis for tissue damage [16,17,18]. Usually, IDDM onset precedes that of CD [18,19] and it was demonstrated that immunological markers of CD (i.e. antigliadin (AGA) and antiendomysial (EmA) antibodies) can appear years after the diagnosis of IDDM [10,20]. In patients with IDDM, regular serological screening can lead to diagnosis of CD in an early phase of mucosal lesion when the subjects are still asymptomatic [17,21,22,23]. Specific studies on intestinal biopsies of patients with the association of the two diseases have not yet been reported in the literature. Therefore, we performed an ultrastructural study in a group of patients with IDDM and CD in order to evaluate the pattern of mucosal lesion. The 267 patients (at December 1997) with IDDM followed at the Diabetic Center of the Pediatric Department of Verona have been regularly screened for CD since 1992. In all patients IgA and IgG AGA (EIA method) and/or IgA EmA (IFA method) were evaluated and in the positive subjects a duodenal biopsy was obtained. Twelve patients (7 males, age range 2.6-20.4 years) of 18 with IDDM and histological diagnosis of CD had also ultrastructural evaluation of their biopsy sample and were therefore included in the study group. Some clinical features of these patients are reported in the Table. All patients fulfilled current criteria for the diagnosis of IDDM (C-peptide levels ≤ 0.5 nmol/I) and CD (positive AGA and/or EmA and consistent histological lesion). Clinical features of the study group. + : positive ; -: negative ; nd : not done. TVA : total villous atrophy ; PVA : partial villous atrophy. Endoscopy was performed in the second duodenal portion using an Olympus GIF-XP10 gastroscope. Olympus FB-19K forceps were used for biopsies. For histology, samples were fixed in 4% neutral formalin and embedded in paraffin. For transmission electron microscopy (TEM), the specimens were fixed in 2.5% glutaraldehyde in Sorensen's buffer for two hours, postfixed in 1% osmium tetroxide in Sorensen buffer for one hour, dehydrated in graded ethanols, embedded in epon-araldite and cut with a Ultracut E ultramicrotome (Reichert). Ultrathin sections were stained with lead citrate and uranyl acetate and observed under a EM10 electron microscope (Zeiss). Sixteen biopsies of children with CD (files of the Institute of Anatomy and Histology) were taken as a control group and treated accordingly to those of patients with IDDM/CD. Eleven of the 12 patients with IDDM/CD had no intestinal symptoms. Only one patient (# 7) had mild diarrhea in the month before CD diagnosis. Histological and ultrastructural findings showed either a totally or partially atrophic duodenal mucosa in all patients (Table). In a single case (# 5), a gastric metaplasia was found at histology. In another patient, histological examination revealed accumulation of PAS-positive material in small groups of enterocytes. In one child (#1) Helicobacter pylori infection was observed at histological examination of the gastric mucosa. At ultrastructural examination, enterocytes showed both reduced height and irregular microvilli in all patients. In 7 subjects (# 1,2,3,4,5,6,10), we found an accumulation of electrondense granules in the apical cytoplasm of enterocytes. Such cells were positioned on the exposed surface, represented about the 8-10% of the epithelial cells and were usually disposed in small groups surrounded by "normal" enterocytes (Fig. 1,2). We did not observe any increase of lymphocyte counts among modified enterocytes. TEM of the duodenal mucosa of patients with IDDM/CD. Apical granules can be observed in a small group of cells in which the Golgi complexes are hypertrophyc, the microvilli are reduced in height and a lipidic accumulation is visible. Bar = 1000 nm. TEM of the duodenal mucosa of patients with IDDM/CD. An area covered with secretory enterocytes is visible on the right. Bar = 1000 nm. In 4 of these 7 patients, a double population of granules was visible (Fig. 3,4,5,6). The former had a diameter of 400-800 nm and an ovoid shape. A biphasic pattern was detected. The more electrondense component was at the periphery of the granule and generated a network in which less electrondense material was visible. The latter type of granules had a smaller diameter (100-200 nm) and a low-electrondensity round core. These granules were mainly at the periphery of the cell, close to the junctional apparatus. Both types of granules were found in cells with enlarged Golgi complexes in the supra-nuclear region. In the other 3 subjects, only granules of the smaller size (100-200 nm) were found in the enterocytes. In 2 cases, enterocytes were sometimes filled with lipid droplets, mainly in their apical cytoplasm (Fig. 1). 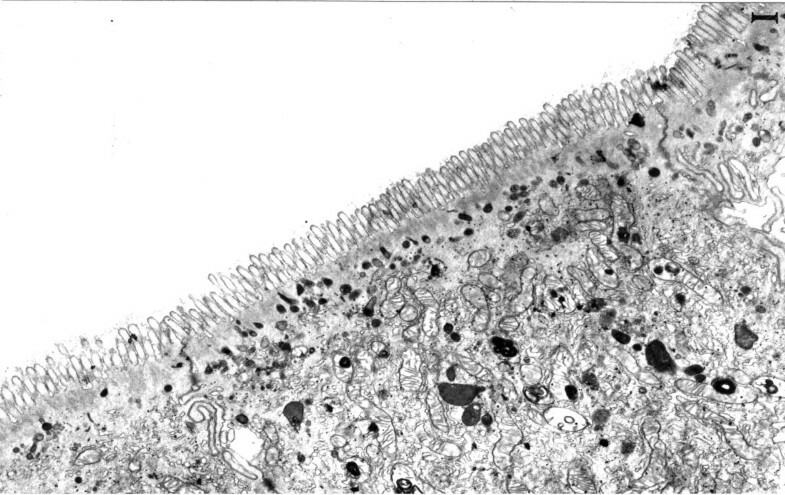 TEM of the duodenal mucosa of patients with IDDM/CD. Enterocytes with large granules are shown on the right. On the left, enterocytes with small diameter granules in the apical cytoplasm. Bar = 625 nm. 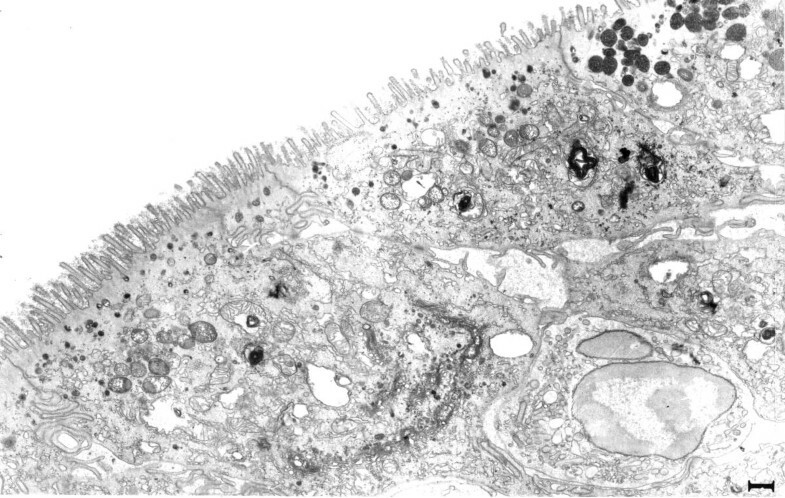 TEM of the duodenal mucosa of patients with IDDM/CD. 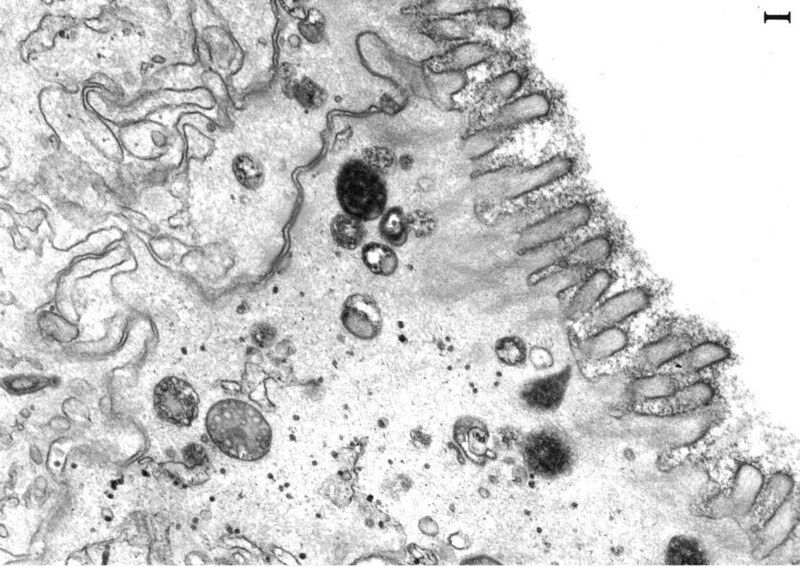 A group of elements with short microvilli and several small granules below the terminal web. Multilamellar lipidic inclusions (arrow) can be observed in the supranuclear portion of the cells. Bar = 500 nm. 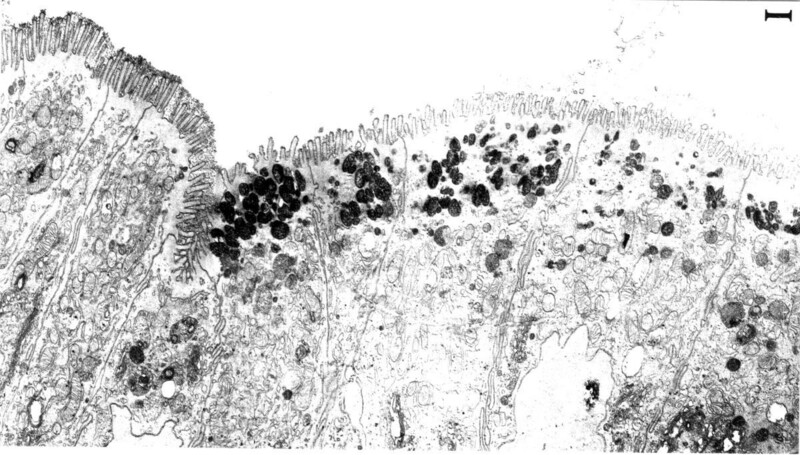 TEM of the duodenal mucosa of patients with IDDM/CD. A cell with both large and small granules at high enlargement. Bar = 125 nm. TEM of the duodenal mucosa of patients with IDDM/CD. In these cells small granules are visible. A single large diameter granule shows atypical internal pattern. Bar = 156 nm. In the control group, optical and ultrastructural evaluation showed either total or partial atrophy of the duodenal mucosa, consistent with the diagnosis of CD. As a rule, no accumulation of secretory granules in the apical cytoplasm of the enterocytes was observed. In a single patient, mild accumulation of 100-200 nm granules was found. In the present work, we characterized the pattern of mucosal lesion in patients with IDDM and CD. In addition to the typical lesion of the celiac intestine (i.e., either total or partial mucosal atrophy), biopsies of these subjects showed a distinctive high frequency of modified enterocytes with accumulated electrondense granules. A similar pattern has not been previously described in CD and we did not found comparable aspects neither in the control group of CD patients nor in the ultrastructural examination of about 150 subjects (personal files). The two main patterns of granule accumulation were found in 58% of our patients (in 33% and 25% of subjects respectively). Nevertheless, because of the small tissue area examined by electron microscopy, we cannot exclude that a similar patchy lesion could have been overlooked in some other subjects. The granules seemed to be secretory and not endocytotic, and also the enlarged Golgi complex we found in the modified enterocytes would suggest their secretory origin. However, it is not possible to be conclusive on this point, especially for the larger granules that have a heterogeneous content as in lysosomial compartments. 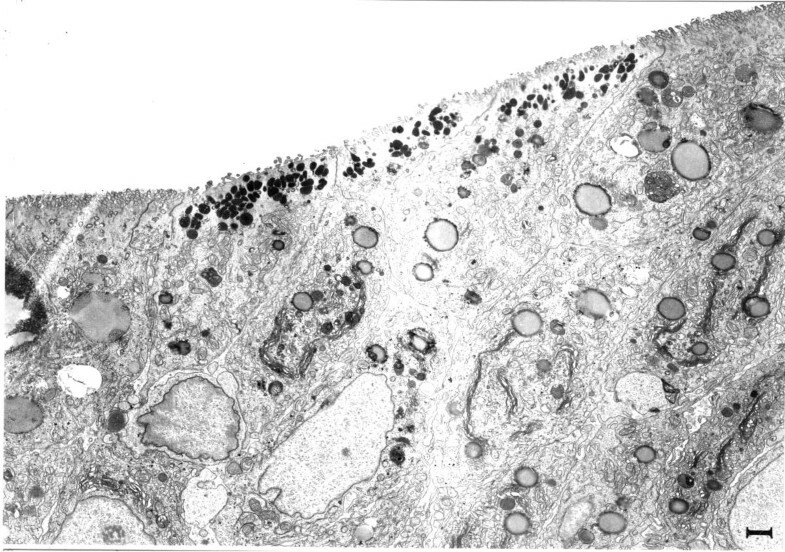 At high magnification, the internal pattern of large-diameter granules resembled that of the gastric superficial mucous cells. Elements with intermediate ultrastructural characteristics between secretory and absorptive cells have been described in intestinal metaplasia of the esophagus and stomach . Therefore, accumulation of electrondense granules in four of our patients could be interpreted as an incomplete gastric metaplasia of duodenal mucosa, on the analogy of incomplete intestinal metaplasia described in the stomach [25,26,27,28], esophagus  and esophagogastric junction . Nevertheless, the pattern we described must be differentiated by other conditions in which PAS-positive material can be found in the apical portion of enterocytes. 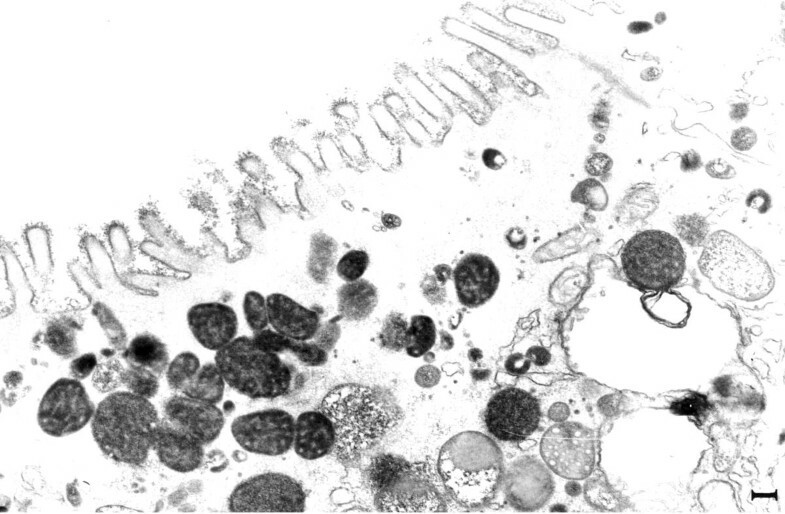 An accumulation of lysosomes is a rather aspecific event visible in several conditions of mucosal damage. Also in congenital microvillous atrophy, small, PAS-positive granules with a homogeneous internal pattern have been described, that seemed to be due to secretory material of the glycocalix . Gastric metaplasia of the duodenum can be due to H. pylori infection  that seems to be frequent in diabetic patients. However, in our group a single patient with incomplete metaplasia showed H. pylori in the stomach. In conclusion, the present work suggests that subjects with IDDM and CD represent a subgroup of CD patients characterized by a distinctive pattern of mucosal lesion. In our opinion, the lesion is not a true metaplasia because the complete transformation of the intestinal epithelium in a gastric-like surface is lacking. In incomplete gastric metaplasia, cells with accumulated granules maintain ultrastructural characteristics of enterocytes (i.e. terminal web, microvilli, glycocalix, etc.). Such a lesion seems rather to be the result of a process of phenotypic shifting by which the morphology of cells is <<shifted>> from an absorptive toward a secretive phenotype. We suggest that this transformation might be related to an abnormal intra-duodenal environment, perhaps secondary to anomalies of gastric emptying as reported in a high proportion of children with IDDM  and in animal models of this disease . From a clinical and pathogenetic point of view, the time has probably come to speculate if, in the conundrum of CD (latent, clinical, autoimmune disease-associated and extraintestinal forms), distinct pathways of cellular or histological damage may occur. Patients with both CD and other autoimmune diseases can be viewed as a suitable study population in which the mechanisms of autoaggressive disease are highly expressed. Further studies should be undertaken to investigate if the condition we described might predispose to development of gastric metaplasia of the duodenal mucosa such as that we found in a single patient. The study was supported by a grant from Regione Veneto, Giunta Regionale, Ricerca Sanitaria Finalizzata, Venezia, Italy.